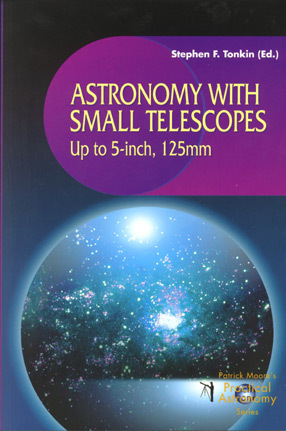 The book Astronomy with Small Telescopes has been published by Springer in its Practical Astronomy Series. I am thrilled to announce that Chapter 9 (25 pages) of this 157 page book is entitled "The Mighty ETX" and was written by your humble webmaster. "Mike Weasner calls his little Maksutov-Cassegrain 'The Mighty ETX' with good reason." The book will be available beginning in April 2001. You can order it from Amazon.com by clicking on the Amazon.com button below. Ordering by clicking the button will help offset some of the costs of maintaining this web site. Thanks for your support. Some of you may be wondering why I selected Amazon.com. I thought about this selection a long time before it was announced. One option was to ask the dealers that are mentioned frequently on this site if they might carry this book. But to avoid favoritism to any of these dealers I decided to use a book dealer. Then it came down to which of my friends who are book dealers should be used. Oops, back to the favoritism problem again. So I went with the anonymous (at least to me) Amazon.com. I hope everyone understands. If you decide to purchase the book, use the link above or purchase from your favorite dealer, whichever you are comfortable with doing. Either way, I thank you for the support. As you can tell, there is a lot more than just my chapter that will be useful to all model ETX and DS owners. He has already started collecting errata on Astronomy with Small Telescopes. Now a selection from the Astronomy Book Club. See the "Using the Meade ETX" page for information about my new ETX book.